The 11th Annual Swish for the Cure event will be held on Saturday February 4, 2017. The multi-faceted event, established in 2005 by Elite Basketball Camps, includes fund-raising initiatives and an action-packed day of fun-filled activities for kids battling cancer and their siblings. In its first five years, Swish for the Cure’s fund-raising initiatives raised over $135,000 for Childhood Cancer Canada. 100% of the funds raised go to Childhood Cancer Canada. 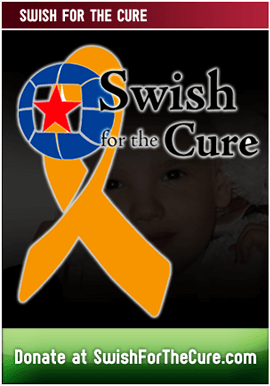 What is Swish For The Cure? The actual Event, a fun day of basketball and other activities for 50 kids with cancer. None of the funds raised in the initiatives described above go toward the day’s Event; every penny goes directly to Childhood Cancer Canada. How do we run the Event without funding and without a budget? Through an amazing voluntary contribution of many individuals and businesses throughout the community coming together to pull it off – donating their services, time, products, and food to ensure every kid walks away with a great experience, enjoying great food and amazing prizes. An Elite Camps staff charity game, featuring some of our best staff. This includes staff who have played, or currently do play basketball in NCAA Division 1, European professional leagues, and on Canadian and US university/college teams. Stay tuned for further details on the date and location of the game. Last year, the 10th year of the event was another great day of fun and activities for all. We had over 100 children come out for the day. With over 150 volunteers including Elite Camps staff, friends, family and Swish for the Cure Committee Members, we ensured every age group had a team leader for the day and EVERY kid was paired up with a volunteer. The overall day is planned and run by Elite Camps. The day includes sports, arts and crafts, carnival activities and many popular local child entertainers. © 2019 Elite Camps. Designed by Gem Webb Internet Marketing and Web Design All Rights Reserved.